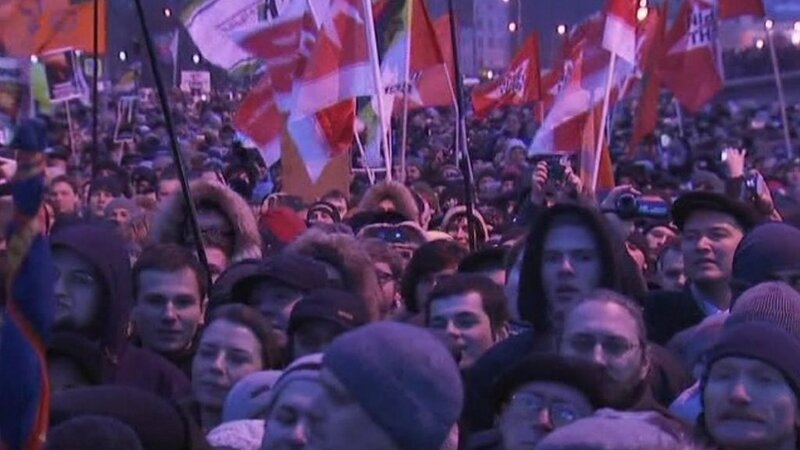 Thousands of people have attended the biggest anti-government rally in the Russian capital Moscow since the fall of the Soviet Union. Other, smaller rallies took place in St Petersburg and other cities. Communists, nationalists and Western-leaning liberals turned out together despite divisions between them. The protesters allege there was widespread fraud in Sunday's polls though the ruling United Russia party did see its share of the vote fall sharply. Demonstrations in the immediate aftermath of the election saw more than 1,000 arrests, mostly in Moscow, and several key protest leaders such as the anti-corruption campaigner Alexei Navalny were jailed. A message from Mr Navalny was released through his blog, saying: "The time has come to throw off the chains. We are not cattle or slaves. We have a voice and we have the strength to defend it." Prime Minister Vladimir Putin has never experienced popular protests like these before, the BBC's Steve Rosenberg reports from Moscow. During his decade in power, first as president then prime minister, he has grown used to being seen as Russia's most popular and powerful politician. But as one of the protesters put it to our correspondent, Russia is changing. Police put the number gathering on Moscow's Bolotnaya Square for the "Fair Elections" rally at 25,000 while organisers talked of 100,000. Nobody believes the elections were free and fair. Many are also asking that the head of the election commission stands down, and some are going even further and demanding that Vladimir Putin himself resigns. There's a real sense of anger - and although the numbers are not that big in global terms, in Moscow terms this is a very, very significant demonstration. This number simply haven't come out onto the streets of Moscow since 1990s. It should not be underestimated what a significant moment this is. It may not deal a fatal blow to Mr Putin's government, but it is certainly the most severe wake-up call he has received during 12 years in power. The BBC's Daniel Sandford reports from the scene that the number seems to be closer to 50,000, and people continued to rally on the square after hearing the speakers. A resolution was passed calling for the cancellation of Sunday's election results, new elections, the resignation of electoral commission chief Vladimir Churov, an investigation into the alleged ballot-rigging and the immediate release of arrested protesters. Konstantin Kosachyov, a United Russia MP authorised to speak on behalf of the Kremlin, ruled out holding negotiations on the organisers' demands. "With all respect for the people who came out to protest, they are not a political party," he was quoted as saying by Reuters news agency. 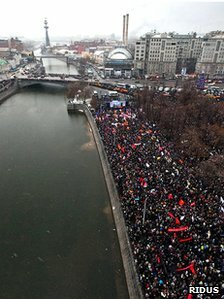 Authorities had permitted the protest on condition the rally was relocated from central Revolution Square to Bolotnaya Square, an island in the Moscow River just south of the Kremlin where access points could be easily controlled. Marchers to the rally streamed across a bridge under the walls of the Kremlin walls, past a long line of police. There were no immediate reports of protest-related arrests in Moscow but the interior ministry reported 130 arrests at rallies across the country, most of them in Khabarovsk in the far east. Protesters in the Pacific port of Vladivostok waved banners with slogans like "The rats should go!" and "Swindlers and thieves - give us our elections back!" 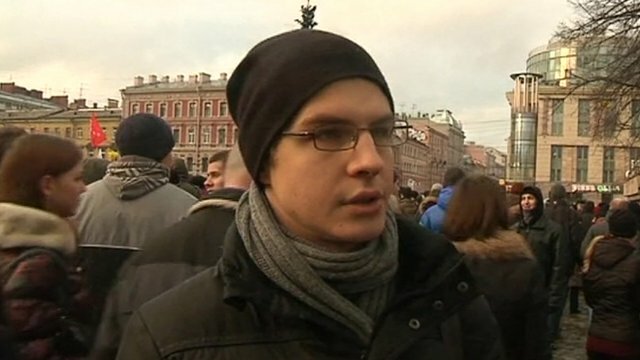 Danil Klubov, a student from St Petersburg, says he is "tired of all the falsehoods and lies"
In St Petersburg, Russia's second city, thousands packed into Pionerskaya Square to hear speeches calling for the election to be re-run and for Mr Putin to resign, the BBC's Richard Galpin reports. The protest was peaceful and well organised though some protesters were dragged away by police elsewhere in the city. Daniil Klubov, a student leader at the rally in St Petersburg, told the BBC students had been under pressure not to attend the protests. "I do not belong to any political movement - I am just a student who is tired of all these lies," he said. He and others, he said, had received anonymous threats on vKontakte, a Russian networking website similar to Facebook, that they faced prison terms, expulsion from university or military conscription. "Some people are really scared but a lot of people understand that the more people who turn out, the better our chances," he added. Police put the turnout in St Petersburg at 10,000. According to the official results of the elections to Russia's Duma, United Russia saw its share of the vote fall from 64% to 49%, though it remains easily the biggest party. But there is a widespread view, fuelled by mobile phone videos and accounts on internet social networking sites, that there was wholesale election fraud and that Mr Putin's party cheated its way to victory. Mr Putin, who was president between 2000 and 2008, remains widely predicted to win a presidential election in March. On Thursday, he blamed the US for stoking the recent unrest, after Secretary of State Hilary Clinton expressed reservations over the poll. Thousands gather in Vatican City to see a historic ceremony where two popes - John Paul II and John XXIII - are declared saints. 4: Who was Father Frans?